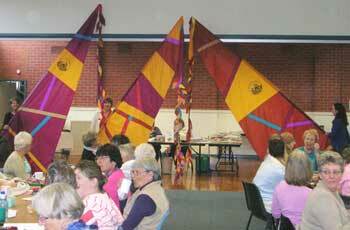 We are a non-profit quilting group based in Geelong, a regional city 70km south of Melbourne, Victoria, Australia. Join us at a Guild Meeting and come back often to keep in touch and see what we are up to. As reported in the first Geelong Patchwork and Quilters' Guild newsletter, September 1985, sixty-three women attended a meeting on 13 July 1985, convened by Heather Strauss, to consider the establishment of a patchwork and quilters' guild. By October it was official - once the Department of Corporate Affairs had approved the constitution discussed and adopted at the September meeting. Fourteen members were listed and seven of them formed the Committee of Management. Guild meetings were held in the Uniting Church Hall, Leopold, 1.30 to 4.30pm. There were Area Meetings in Belmont, Ocean Grove, Newcomb, Portarlington and Geelong West. Entrance fee - $2; annual subscription - $10 ($20 July 1987); monthly Guild meeting - 50 cents; hall rental - $30; the incorporation fee - $60. Each newsletter included a Block of the Month and a library was building within 12 months. Workshops and speakers were an important part of Guild activities from the start. A logo competition was called in December 1985. In April nine designs were presented for voting and the round design by Suzanne Del Papa was chosen. In November 1986 the logo first appeared on the newsletter. The first Guild Exhibition was held in November 1986 in the Geelong State Offices. The newsletter was first called Common Thread in May 1993. Decision that during meetings, financial matters will be dealt with between 1.30 and 2.00pm only and all organised activies will start at 2.00pm. The Guild gained a place in designing something that depicts the Geelong area for the Bi-centennial - only 34 areas throughout Australia were given a letter. "We have been allotted the third 'i' in the word Exhibition from Australian Bi-centennial Exhibition 1988." The finished banner travelled during 1988 and was much admired. In October, the Guild was awarded a 2" (5cm) commemorative silver medallion, under the Women Celebrate '88 program for it's contribution to the celebration of Australia's Bi-centenary. Meetings moved to the YWCA rooms, 19 Aberdeen Street, Newtown. Deadline for the Happy Birthday Australia block - a Guild competition for the Bi-centennial. (Piece or applique an original block 12 1/2 inches square depicting something Australian - flora, fauna, a person or event.) The 16 blocks were made into a quilt (72 inches square) which was re-discovered in the cupboard in 2008! In November 2008 we had a 'Let's Revisit 1988' day with a display of the above quilt, the original design plans for the third "i" in the banner and photos of the banner and of Eastern Park and craft and clothing of the era. The members of the Geelong Patchwork & Quilters’ Guild are invited to participate in this on-going project by making quilts to the specifications below and passing them onto the Quilts of Love Guild Co-ordinator, Adrienne Hare. These small quilts are ultimately given to the parents of infants who are still born or die soon after birth. The parents can use them to wrap their child in or keep them as a memento. In late 1996, following the lead of the Earlwood Piece Makers of Sydney, two of our members proposed that the Guild take up this project. The idea was well received by the membership and has been seen to be an appreciated community service. Quilts of Love are given predominantly (around 30 each year) to the Special Care Nurseries of Geelong Hospital and St. John of God Hospital, Geelong. On occasion, excess stocks of Quilts of Love are given to the Special Care Nursery at the Royal Women’s Hospital where there is a great need. The membership has also voted in the past to make Christmas quilts and matching stockings for the infants in long term care in the RWH over Christmas. In December 2000, 33 quilts made by The Heights Sewing Group and passed onto the Guild, were given to the Special Care Nursery at Geelong Hospital for the infants staying over Christmas. The Guild has received many letters of appreciation from the recipients of these Quilts of Love which is testament to the value of the project. Quilts of Love can be made using any patchwork, embroidery or appliqué style. The fabric, batting and quilting method are at the discretion of the quilter. Quilts for this project should measure between 15 and 20 inches square, although other shapes within these dimensions are suitable. Whilst these donations are anonymous as to their maker, the Guild’s name and address is attached to each quilt. Members may pin their names on the quilts they have made and these will be recognised in the Common Thread Newsletter.